Illinois Tool Works' Investor Day Presentation: Is the Stock a Good Value? 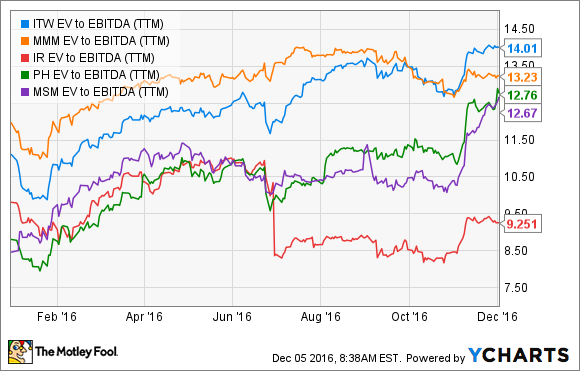 Alongside 3M Company, the diversified industrials stock's valuation looks a bit rich, so future growth is key. Here's the lowdown on the recent updated outlook from management and what to expect in 2017. Illinois Tool Works Inc. (NYSE:ITW) management has cheered investors by underpromising and overdelivering with its 2012-2017 enterprise strategy plan. A combination of cost cuts and focusing on more lucrative activities via Product Line Simplification (PLS) has led to operating margin expansion, even within moderately growing end markets. It's largely the reason behind the stock's outperformance this year, but can the strong run continue? Let's take a look at the company's investor day guidance and outlook, and see what it means for investors. ITW EV to EBITDA (TTM) data by YCharts. The company and its fellow high-quality peer 3M Company (NYSE:MMM) are starting to look expensive on an absolute and relative-to-peer-group basis. However, stocks can grow into their valuations, so the question is whether the investor day outlook is enough to justify the premium valuation or not. The 2017 guidance is laid out below. For reference, the company is still in its fiscal fourth quarter, so the following 2017 guidance is based on management's estimates for 2016. DATA SOURCE: ILLINOIS TOOL WORKS PRESENTATIONS. BP = BASIS POINTS, WHERE 100 BP IS 1%. The guidance implies EPS growth of 9% at the midpoint, promulgated by an improvement in the organic growth rate and ongoing operating margin expansion. As you can see above, the margin expansion is assumed to come from the company's enterprise initiatives. In terms of valuation, the midpoint of 2017 EPS guidance puts the stock at a forward P/E of 20.5 times earnings. It's hardly a cheap rating, but there are three factors relating to the near- and mid-term guidance that might make it easier for investors to buy into the stock. WELDING HAS BEEN CYCLICALLY WEAK FOR ILLINOIS TOOL WORKS IN 2016. IMAGE SOURCE: GETTY IMAGES. Management's guidance looks conservative and may create potential for upside surprise. Guidance for operating margin is to expand to 25% by 2018, which creates EPS upside. Management believes it can grow organic revenue at 200 basis points above the market. During the investor day presentation, management outlined that it was assuming 1% of organic growth decline from lower auto builds (automotive OEM segment), and it wasn't baking in any assumption for a bounce in industrial and oil and gas capital spending (welding segment). However, it's far from clear whether auto production will decline in 2017, and with oil above $50 and most commentators forecasting a return to growth in industrial production next year, the guidance may prove conservative. Turning to margin, clearly, investors will have wondered what happens to margin expansion when the company gets to the end of its enterprise strategy in 2017. The answer is that management believes it can continue to expand margin to 25% by the end of 2018 via cost-cutting and investing in its most important product lines. As for growth, if organic revenue can grow at 200 basis points and management's estimation of 35% incremental leverage (meaning operating income will increase by 35% of the increase in revenue) above the market, then any upside to economic growth will lead to a larger increase in income. THE AUTOMOTIVE SECTOR IS A KEY END MARKET FOR ILLINOIS TOOL WORKS. IMAGE SOURCE: ILLINOIS TOOL WORKS. Was the investor day presentation enough? All told, Illinois Tool Works is clearly a very well-run company, and the outlook from the investor day is positive. However, most of the potential upside surprise to the guidance relates to stronger economic growth. In that sense, there are probably cheaper ways to buy into the thesis that industrial conditions will get better in the next couple of years. It's an attractive company, but this doesn't look like a great entry point on a risk/reward basis, and the investor day presentation didn't do quite enough to make the stock look like a good value to this author.